Haunter in game: 2,348 Who? Important notice! Pokemon Haunter is a fictional character of humans. 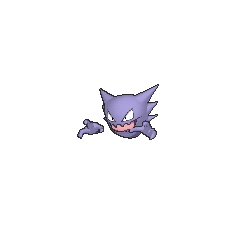 Haunter (Japanese: ゴースト Ghost) is a dual-type Ghost/Poison Pokémon introduced in Generation I. It evolves from Gastly starting at level 25 and evolves into Gengar when traded. 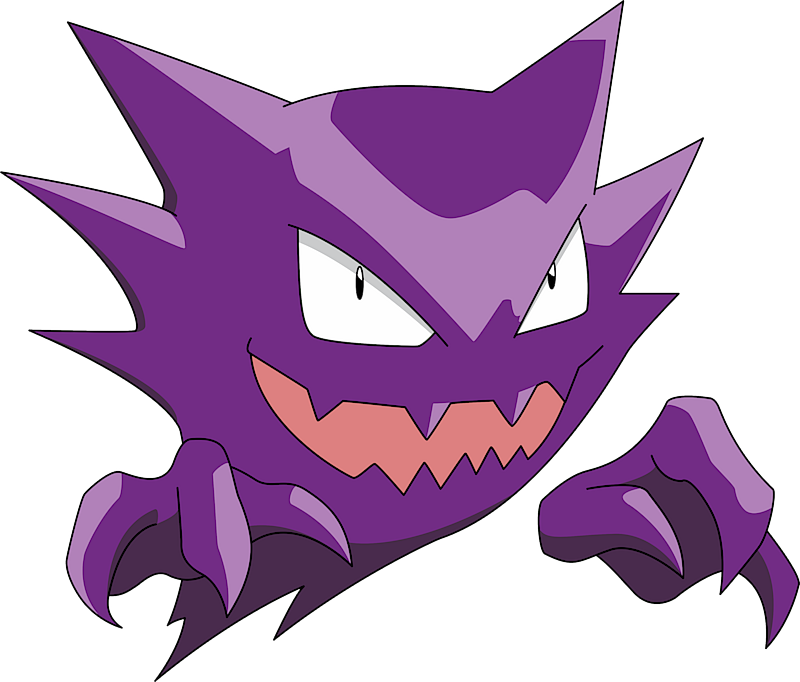 Haunter is a purple Pokémon with a gaseous body. It has a round head with a pair of disembodied hands. Each hand has three pointed fingers. Its head is flanked by three large, spiked protrusions on either side, and its eyes are large and triangular with small pupils. The gases composing its head curve down to form several pointed teeth framing a pink mouth and a long tongue. Its body tapers into a jagged tail. Haunter hides in very dark places, where it plots to take the life of the next living thing that comes near it. It silently stalks its victim and steals its life force with a lick from its gaseous tongue, which inflicts convulsions that persists until the victim dies. It has the ability to float through solid walls. Despite its predatory nature, it has been known to entertain and prank people in the anime. Additionally, it has even been shown to feel intense loyalty to a deceased Trainer. Haunter lives in dark, abandoned caves. A Haunter appeared in A Shipful Of Shivers guarding the Orange league trophy of its deceased Trainer along with a Gastly. Morty used a Haunter to battle Ash in From Ghost to Ghost. Several Haunter attacked Meowth, Pikachu and a group of lonely little Pokémon including Pidgey, Oddish and Rattata in Hoenn Alone!. In Fear Factor Phony, a Haunter was living in an abandoned mine with several other Ghost Pokémon. The Ghost Pokémon were having difficulty with the partying PsychicPokémon living nearby. A Haunter appeared in PK15. Lon owns a Haunter that appeared in Scary Hospitality!. It is used by Lon, alongside his Gastly and Gengar, to scare visitors of the "Scary House". A group of Haunter appeared in Illusion Confusion!, along with a group of Gengar. A Haunter appeared in the opening of Destiny Deoxys. A Haunter appeared also in Ghoul Daze!. Another Haunter appeared in Old Rivals, New Tricks!. A Haunter appeared in SM003, during a fantasy. A Trainer's Haunter appeared in SM006. EP023 Haunter Ash's Pokédex Haunter, a Gaseous Pokémon. No further information. EP095 Haunter Ash's Pokédex Haunter, the Gas Pokémon. After evolving from Gastly, this Haunter can learn the Dream Eater and Psychicattacks. XY072 Haunter Serena's Pokédex Haunter, the Gas Pokémon and the evolved form of Gastly. 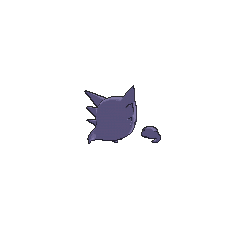 Haunter can watch opponents by hiding in walls and slips through anything in its way. Red's Haunter appeared in File 3: Giovanni. He used it against Sabrina's Alakazam and won. It evolved into Gengar sometime before File 4: Charizard. The illusion of a Haunter appeared in The Old Chateau, tormenting Cheryl and her Chansey. In The Electric Tale of Pikachu, Ash encounters a giant Haunter called the Black Fog, notorious for using its Dream Eater attack to kill people and Pokémon by stealing their souls. Sabrina has a vendetta against this Haunter, as her Pokémon were attacked and killed by it when she was eleven, but she falls victim as well in her attempt to protect a team of people trying to hunt it down. With the combined effort of Ash and the team of hunters, the Black Fog managed to be weakened enough for capture, only for it to promptly use Selfdestruct, killing itself right before Ash's Ultra Ball reaches it. In Lapras Lazily a boy that Blue met near the abandoned Power Plant had a Haunter in his team before it was stolen, with which he later fights Agatha's Gengar to free Blue from a coffin composed by a Dream Eater attack. Agatha also had armies of Haunter that she used in her attack on Kanto Which first appeared in said round. In A Flaaffy Kerfuffle a Haunter appeared where it was one of the Pokémon in Professor Oak's fantasy when he explains that trainers should only have six Pokémon with them. Eusine was later seen with a Haunter in The Last Battle VI. It proved useful in knocking out the Masked Man's Gastly after the latter wounded Suicune with its Curse. Another Haunter appeared in The Last Battle XIII as one of the Pokémon sent to help the fight in Ilex Forest. Haunter debuted in Get Rid Of The Ghost Pokémon!! where it was under the ownership of Blue. It evolved into Gengar in the same part. A Haunter appeared in Which One is the Real Clefairy!? where it was giving the citizens a tour around the area along with Clefairy. Giovanni was revealed to have a Haunter when it attempted to battle a Squirtle of his. 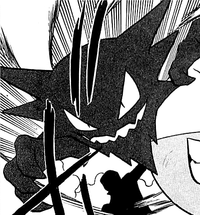 Eusine also has a Haunter in the manga. Pokémon Pinball: Two Haunter appear in a bonus stage accessible from the Red Table. Once the player knocks out the three Gastly, the pair of Haunter appear, and upon knocking them out, the player must then proceed to defeat the Gengar that appears. Pokémon Mystery Dungeon: Explorers of Sky: Haunter is the main antagonist in the Special Episode Today's "Oh My Gosh", where it is later revealed there are three Haunter working together. If you trip and fall for no apparent reason or hear a sound when no one is around, it may be a Haunter. If a Haunter beckons you while it is floating in darkness, don't approach it. This Pokémon will try to lick you with its tongue and steal your life away. Moves marked with a superscript game abbreviation can only be bred onto Haunter in that game. 51%-100% HP There is nothing that can impede me! Level up I've leveled up! Put your trust in me! If Haunter disappears, it will reappear behind your Pokémon and spirit it away. It attacks by spitting out orbs imbued with loathsome emotions. Haunter often play in the Haunted Zone. When it comes to Rotom's Spooky Shoot-'em-Up, Haunter are hard to beat! 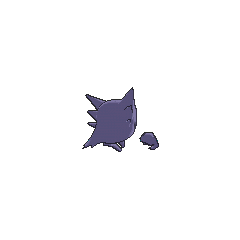 For other sprites and images, please see Haunter images on the Bulbagarden Archives. In the Pokémon Red and Blue beta, Haunter's prototype name was "Spectre". The Pokémon Trainer's Survival Guide also erroneously references Haunter by this name on one page. At 0.2 lbs. (0.1 kg), Haunter is tied with Gastly, Flabébé, Cosmog and Kartana as the lightest Pokémon. No other Pokémon have the same type combination as Haunter and its evolutionary relatives. 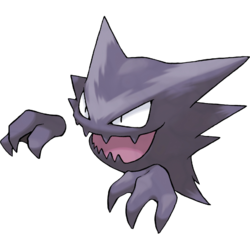 Due to its unique type combination, Haunter and its evolutionary relatives are the only Poison-type Pokémon that are weak against Dark-type moves. Haunter is possibly based on the dila, a spirit that passes through walls then licks certain humans to death according to Filipino mythology. It also appears to be based on a generic sort of cartoonish ghost. Haunter is derived from haunt, as ghosts are known to do. It could also be a corruption of "hunter". Cantonese Chinese 鬼斯通 Gwáisītūng Rough transcription of its Japanese name. Also a combination of 鬼, 瓦斯, and 通.
Mandarin Chinese 鬼斯通 Guǐsītōng Rough transcription of its Japanese name. Also a combination of 鬼, 瓦斯, and 通.